To automatically delete Robot Alert history using Robot Schedule, you must first create a reserved command variable that calculates the date minus seven days. Then, you use that variable in the programs RBA905 and RBA906 to delete all but the last seven days of transmission and message history. In Robot Schedule, access the Reserved Command Variable panel. In the Parameter field, enter I-007. This means you want the ISO date minus seven days. Press function key F12 to save and exit. Find the new variable in the list panel and enter a 2 next to it. This shows you a value. If the date is seven days earlier, you have defined the variable successfully. Note: When you use a reserved command variable with programs RBA905 and RBA906, the variable must call the program RBT013. where: PARM is 29 characters. The From date is 1940-01-01. All history from January 1, 1940 to the To date will be deleted. 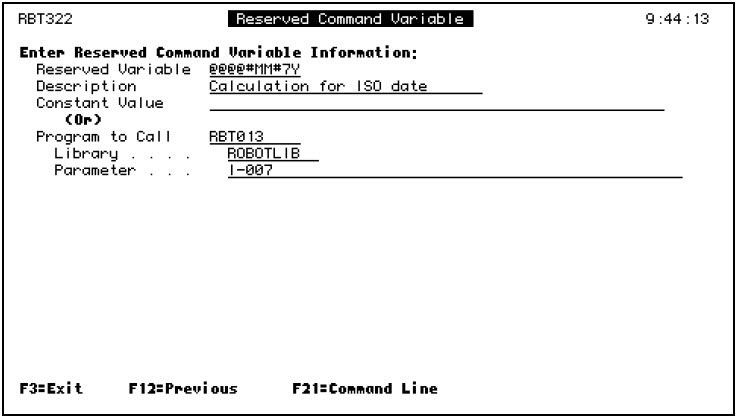 The To date is a Robot Schedule reserved command variable that calculates today's date minus 7 (see the previous page for information about creating the Robot Schedule reserved command variable). Using a From time of 0000 and a To time of 0000 guarantees that all of the history in the specified date range will be deleted. Note: To delete all Robot Alert history, specify the From date as 1940-01-01 and the To date as 2039-12-31.